We’d love your help. 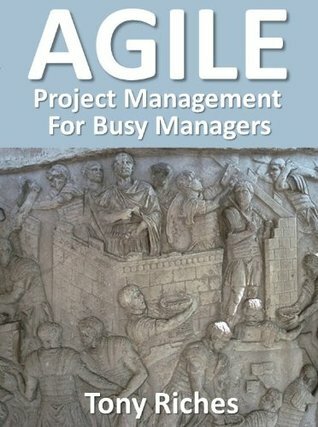 Let us know what’s wrong with this preview of AGILE Project Management for Busy Managers by Tony Riches. Managers have become skilled at juggling changing priorities. What is different is that customer expectations have changed. People expect shops to be open earlier and later, to get answers on line 24 hours a day, seven days a week, and appointments outside of normal working hours. At the same time there is huge pressure to reduce operating costs, staff numbers and to do mo Managers have become skilled at juggling changing priorities. What is different is that customer expectations have changed. People expect shops to be open earlier and later, to get answers on line 24 hours a day, seven days a week, and appointments outside of normal working hours. At the same time there is huge pressure to reduce operating costs, staff numbers and to do more with less. Many traditional project management approaches are about attempting to limit change to 'keep the project on track'. This is fundamentally the wrong approach. If something needs to change with a project it should or you risk project failure. To ask other readers questions about AGILE Project Management for Busy Managers, please sign up. High level overview does not get into nuts and bolts of running an agile project but good read. Not for agile enthusiasts or practioners. High level book over viewing agile. Feels like it was written as a brief by a busy manager and not fully proof read in some sections. very average book, quickly written and doesn't give any real insights. The book is a very, very quick introduction to the agile topic. Tony Riches is a full-time author from Pembrokeshire, West Wales, an area full of inspiration for his writing. After several successful non-fiction books, Tony turned to novel writing and wrote 'Queen Sacrifice', set in 10th century Wales, followed by 'The Shell', a thriller set in present day Kenya. His real interest is in the history of the Tudors and now his focus is on writing historical fictio Tony Riches is a full-time author from Pembrokeshire, West Wales, an area full of inspiration for his writing. After several successful non-fiction books, Tony turned to novel writing and wrote 'Queen Sacrifice', set in 10th century Wales, followed by 'The Shell', a thriller set in present day Kenya. His real interest is in the history of the Tudors and now his focus is on writing historical fiction about the lives of key figures of the period. Best known for his Tudor Trilogy, Tony's other international best sellers include 'Warwick ~ The Man Behind the Wars of the Roses' and 'The Secret Diary of Eleanor Cobham'. In his spare time Tony enjoys sailing and sea kayaking. Visit Tony online at www.tonyriches.co.uk, Tony Riches Author on Facebook and follow him on Twitter @tonyriches.